Fenella Halstead, reasearching effects of honey. The British Burn Association (BBA) supports and encourages research into many aspects of burn care by providing a platform for discussion and dissemination. 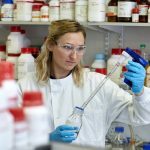 Work currently underway in different research establishments around the British Isles include; basic science research on the effects of burn injury on the immune system, wound healing and scarring; the use of non-antibiotic based means of controlling wound contamination and the effects of smoke on the respiratory system. Clinical research continues on the psychological recovery from burns and the best means of organising and delivering burn care. Work is also underway on the most effective means of skin grafting large area wounds and the use of composite skin replacements in reconstructive surgery. Collaborative work is underway between clothing flammability and hot water research establishments to best understand the manner in which many of the most serious burn injuries can be prevented or minimised. Details of the work being presented at each Annual BBA Scientific Meeting will be presented on this web site when available.